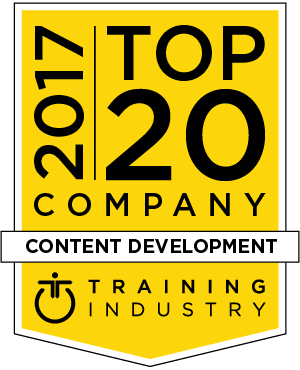 This list recognizes the 2017 Top 20 Content Development companies in the training industry and is designed to help buy-side organizations in their search for the right training partner. Because of the diversity of services included in content development engagements, no attempt is made to rank the Top 20. With more than fifteen years of experience, Allen Interactions has a track record in delivering dynamic enterprise custom e-learning solutions that execute business change and improve performance, accelerate speed to profit and improve people effectiveness. Allen Communication’s team solves business problems with custom learning solutions. They bring creativity into instructional design and have built programs that impact companies by improving human performance. General Dynamics helps organizations by analyzing performance issues, building critical skills, driving behavior change and measuring results. They combine instructional design, learning technologies and project management with an understanding of what drives performance in sales, operations and management. CGS Enterprise Learning works with clients to design and execute onboarding programs that accelerate business performance, organizational change and talent retention in the format that works best for your culture - whether instructor-led, digital learning, or a blend of several approaches. Caveo Learning is a consulting firm providing learning strategies and solutions to Fortune 1000, not-for-profits, and other leading organizations. They work to enable learning leaders to deliver targeted, recurring and recognizable business value. Caveo delivers ROI-focused strategic learning and performance solutions to organizations. NIIT is a market-leading, global managed training services company that helps companies improve the effectiveness and efficiency of their training. NIIT's managed training services includes custom curriculum design and content development, learning administration, learning delivery, strategic sourcing, learning technology and advisory services. Cegos is an international leader in training and development. The Group trains 250,000 people around the globe every year across 50 countries, in more than 20 languages. Cegos has content covering topics that address modern business challenges and, over the past ten years, has delivered more than 2000 international training projects. GP Strategies is a global performance improvement company. GP Strategies is a leader in sales and technical training, e-learning solutions, management consulting, and engineering services. Custom training design, development and delivery has been the primary focus of GP Strategies since 1966. InfoPro Learning creates learning models and frameworks to perfect innovative learning solutions and maximize the performance from the learning interventions. InfoPro Learning has experience delivering training solutions in over 80 countries. Kineo's custom learning solutions are designed to meet needs and are tailored to context and audience. The key is a learning experience that feels completely authentic to learners. Learning solutions are based on a practical approach to ensure learning is engaging, leads to knowledge transfer and improves performance in the workplace. Conduent offers a well-constructed learning and development eco-system that increases effectiveness by connecting employees at all levels to a broad range of content, processes and technologies to drive performance. The product of merging AchieveGlobal and The Forum Corporation, AchieveForum’s legacy includes hundreds of clients across more than 50 countries and the capabilities to address pressing leadership development challenges. AchieveForum partners with clients to design and execute leadership development solutions that drive business results. CrossKnowledge’s learning content and formats are developed in collaboration with an international faculty, comprising the best authors, professors and management professionals. CrossKnowledge has created the CrossKnowledge Academy to formalize and share its expertise in instructional design and deployment with its clients via certification programs. SweetRush, Inc.’s approach to instructional design helps to retain and enrich an organization’s talent pool. They align the learning objective with desired business outcomes, and then focus on the learner. SweetRush Inc. provides custom content development in a variety of areas such as e-learning, performance support, communications, and many more. Aptara transforms content for engaging and monetizing new digital and corporate learning audiences. Aptara's training programs are designed based on how and where employees like to learn, with curricula structured for delivery to any platform or device for an increase in retention and performance. Raytheon Professional Services (RPS) is a global leader in training services that help organizations drive workforce performance across the enterprise. RPS analyzes, designs, implements and manages customized and scalable training solutions to increase efficiency and effectiveness. RPS offers a range of solutions from content development to delivery and training support. Pearson’s professional training group partners with corporations, associations, non-profits and government agencies to create effective services and solutions that align with their online, blended learning and professional development goals to improve business and organizational results. LEO’s experience helps them understand how technology aids people to think and perform at their best. From bespoke e-learning to highly impactful drama scenarios and classroom-based immersive VR games, they have the depth and breadth to transform their client’s learning. TIS (MPS Interactive Systems) leverages its experience and comprehensive capabilities to drive a growing training business. While its business focuses on content development, TIS provides comprehensive learning consulting services, proprietary tools and technology needed to provide total training solutions. As part of our commitment to continuously monitor the training marketplace for the best providers and services we announce the 2017 Content Development Companies Watch List. This list recognizes companies from all over the globe that provide content development services. The 2017 Content Development Companies Watch List is intended to help buyers of training services evaluate learning portal providers. LearningMate’s services span from consulting, custom courseware, rich media development, product development, learning analytics, and LMS customization, administration and maintenance services. eLearning Brothers provides their customers with deeply immersive and visually explosive learning experiences and set the pace for the innovative use of learning technology. Ardent has helped clients thrive in business by developing custom learning solutions. Ardent's solutions focus directly on what a client’s audience needs to learn. They are learning experts and deliver custom content with methods such as e-learning and m-learning, webinars, classroom training and videos. Mind Tools’ 2,400+ resources focus on leadership, management and personal excellence skills. Mind Tools’ content is presented in a wide variety of formats, from articles, workbooks and bite-sized learning modules to quizzes, videos, infographics, podcasts and online forums. d’Vinci partners with organizations to achieve results through education, learning and technology. The d’Vinci team of learning specialists, creative designers and application developers collaborates with clients to not only deliver engaging learning solutions but also to meet 508 compliance and enhanced security requirements. Enspire builds learning experiences designed to delight, educate and change behavior. Enspire creates spaces for people to test what they have been taught with all of the pressures of the real-world, but without the consequences. TrainingFolks is a global provider of custom-learning solutions, consulting and contingent workforce services. Combining adult learning experience with a proven engagement methodology that includes a talented network of learning professionals, TrainingFolks collaborates with clients to implement change. SwissVBS is a full-service digital learning design and production agency, focused on providing value at every step of the learning journey. SwissVBS leverages their suite of offerings to create industry-leading, customized learning solutions that drive meaningful change in behavior and performance. CARA provides human performance consulting resources and creates customized training programs for any delivery method, including classroom, webinar, e-learning, mobile and blended. Cognizant’s Learning and Content Practice-one of the largest integrated team within its Digital Engagement Practice (DEP) consists of more than 1,000 learning and content professionals. The team has been providing end-to-end learning and content solutions for over a decade to a broad range of customers. Actio Learning creates custom development maps, courses and innovative learning experiences. They create strategic data-driven training curriculums and programs that balance organizational goals to solve business problems and build world-class performing employees. They focus on the business leader, training officer and learner as a collective whole. Ej4 creates custom videos for clients that help communicate everything from product knowledge, selling techniques, culture education, and much more. Ej4 offers clients the option to pick and choose: use off-the-shelf content for some topics, customize others and/or create new videos. PulseLearning creates leading-edge, innovative learning solutions that bring measurable business value to clients. They achieve this through a high-energy, client-centric approach that combines excellence in people, process, partners, technology and innovation. Cinécraft designs and develops custom e-learning solutions, behavior changing video and serious games to support the performance goals of clients. The deliverables include e-learning, video, instructor-led training, virtual instructor-led training, booster training and performance support tools. The Training Associates (TTA) helps clients and partners improve performance and profitability by assisting organizations of all sizes and industries by providing cost-effective, tailored solutions that align with their unique training needs and business objectives – regardless of project size, scope, or location.